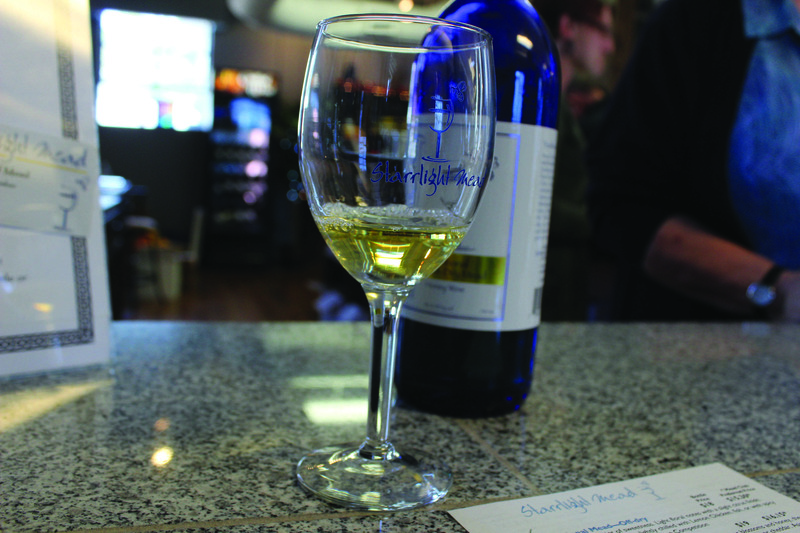 Southern Neighbor reporter Molly McConnell visited Starrlight meadery in Pittsboro to review their honey wines and learn about their brewing process. With her husband out of the country, Becky Starr, with strands of iridescence in her hair, is running their meadery in Pittsboro. “I think she’s here for me,” she tells another employee as I walk up to the bar lined with bottles of mead. Ben and Becky Starr first tried mead, an alcoholic drink made by fermenting honey, at a Renaissance fair. After moving to North Carolina and meeting friends who brewed mead, they ordered a homebrew kit. That was 12 and a half years ago. Two years later, in 2006, the Starrs entered three meads in a competition in Boulder, Colorado, and took home a Best in Show award. Now, the Starrs produce 19 flavors of mead for their business, Starrlight Mead. Last year, that totaled 1,100 cases, or 12,000 bottles, of mead. Becky says they chose Pittsboro after being discouraged by high rent prices in the American Tobacco district of Durham. “People are willing to drive to visit wineries,” she tells me. Having just discussed Chatham County with my companion as we drove down U.S. Highway 15-501 from Chapel Hill, I have to ask her about Chatham Park, the new development planned for 7,000 acres in Pittsboro. As a member of the Pittsboro Business Association Board, she says other business owners are worried because the development could bring in stores to replace the locally owned existing ones. But the Starrs are not concerned. 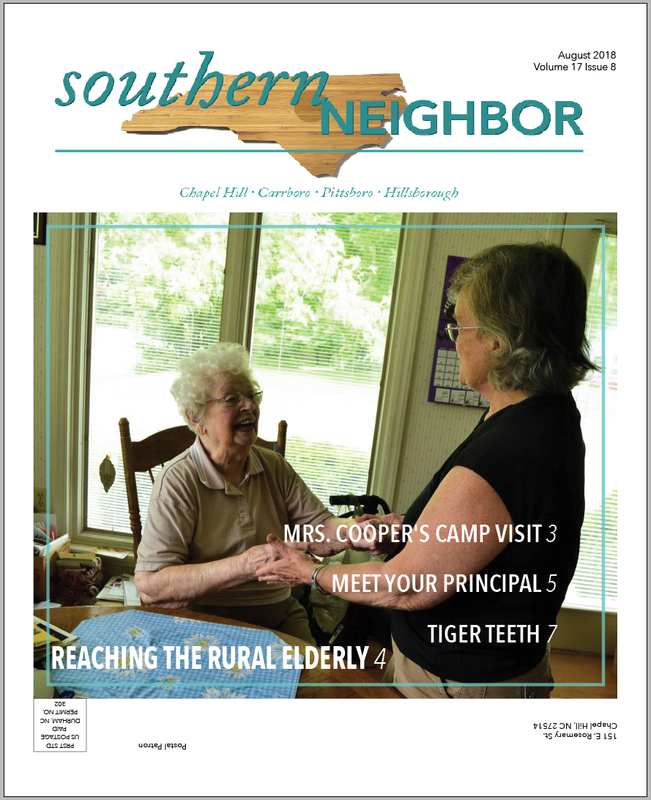 “The more customers in our backyard, the better for business,” she said. According to Becky, 80 percent of visitors to Starrlight Mead have never tried mead before, me included. This is helpful for the community of mead-makers at large, though. “When people try a mead, they say, ‘Let’s try other meads,’” Becky said. There is another meadery in theTriangle — Honeygirl Meadery in Durham. Diane Currier, mead-maker at Honeygirl, actually worked at Starrlight Mead one summer, and Becky says the sense of community between the meaderies is strong. “Last time we saw her, she brought samples for Ben to try, actually,” she said. Mead is a fast-growing segment of the United States alcohol industry. Average U.S. meadery sales in 2013 were $112,000, an increase from $48,624 in 2012. The Starrs are currently raising money to build a new mead hall and meadery — two separate buildings — on Lorax Lane, still in Pittsboro. Becky shows me plans for the new mead hall and design inspiration, and I sigh, upset that I will be gone once it is completed, which will be hopefully early next summer. Before the tour begins, Becky directs me outside to speak with Jennifer Hansen, one of the meadery’s oldest employees. Her blue and pink chin-length hair is tied back with a gray and pink scarf, and she’s deseeding and deveining jalapeno peppers for the seasonal Kickin’ Cranberry Orange Mead. Hansen tells me she first tried mead while working at a Renaissance fair in Colorado. When the Starrs were opening the meadery, Hansen was having her first child and was looking for flexible work, and this was a perfect fit. She says she loves the work. This is most notably tasted in the Pomegranate Pink Peppercorn Mead, which the Starrs developed while Hansen was fighting breast cancer. At the time, the proceeds from the sales went to her medical costs, but now, the proceeds benefit other women fighting breast cancer. The meadery tour is small because most of the mead-making is contained in one room. Within the room are shiny silver tanks, one 1,000 liters and one 2,000 liters. Becky explains the process of making mead, and listening to her, it sounds simple. But this is underestimating the chemistry at play. First, the honey. The Starrs buy their honey from North Carolina beekeepers, but because of the high prices of honey in North Carolina, this might change. Last year, they bought just under four tons of honey from all over the state. Honey varies in taste according to region and harvest time. The Starrs mix different honeys in the mead to achieve a new, more unified flavor. It is poured into the tanks from five-gallon buckets, and the amount is equivalent to over 1,000 plastic bears full of honey. Then, water is added. Yeast is next, though the yeast must be tempered before being added to the sugary honey and water mixture. It takes four to six weeks to produce an alcohol, and after six weeks, the mead is allowed to rest even longer to let the yeast particles settle to the bottom of the tank. The mead is then filtered, bottled and corked by hand. “Yes, my husband looks like Popeye … not true,” quips Becky. The questions are few, and Becky directs us all to the bar. “You all just want to drink,” she says. No one disagrees. We are given sheets with the available meads and can check eight meads to try for seven dollars. My companion and I, who are sharing a tasting glass, debate each type. With each one, Becky explains the process and the taste profile. I taste summer in the Sweet Peach Mead and in the Semi-Sweet Blackberry Mead. The Spiced Apple Mead, though, emits a warm, spicy aroma, bringing with it thoughts of Thanksgiving and Christmas and a pot of warming mead on the stove. As the tasting finishes and Becky wraps my tasting glass to take home, she asks if I would like to purchase any mead. “Not today,” I say, though I am already considering buying mead for gifts, especially for people who will let me drink some of it with them. My companion and I walk from the Starrlight into the sunlight, the taste of honeyed wine lingering on our tongues.